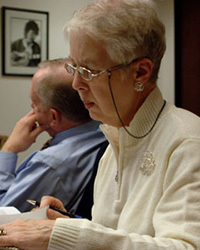 In 2007 the Board presented the Rex Chapman Award to Linda Listoe. Linda began her career at Retirement Housing Foundation on June 1, 1969, and she retired on July 14, 2006. Linda is from Pennsylvania, and she came to RHF via Washington, DC, where, for a time, she worked in government services. 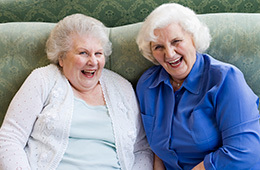 Linda was the third staff member of Retirement Housing Foundation. While her initial position was that of Executive Secretary to Rev. Clark Harshfield, her duties expanded to handling everything from finding sites to develop to filing HUD applications to working with architects and construction companies and going to final closings with HUD. Her final title, Senior Vice President of Corporate Services/Corporate Secretary saw her handling all of the legal documentation involved with creating and maintaining the status of our not-for-profit corporations. When Linda started in 1969 there were four communities and two under construction. In her 37 years with RHF, she experienced and participated in the phenomenal growth in our mission. She knows the unwritten history of many of our properties and the corporation, and we have encouraged her to write that history in her retirement. For her 37 years of dedication to the RHF Mission, we are pleased to honor a special person who helped to make the mission happen: Linda Listoe.